The West Virginia Short Line Railroad meandered along Fishing Creek in Wetzel County in the early 1900s. Pine Grove, West Virginia, will host the Shortline Ramp Festival this April for the fifth year in a row. It’s exciting when an annual event reaches its fifth year, and as a celebration of the “ramp,” or wild leek, I hear the festival is among the best. Perhaps most importantly, it celebrates the West Virginia Short Line Railroad, a lesser-known, 60-mile rail line opened from Clarksburg, in the Monongahela Valley, to New Martinsville, on the Ohio River, in 1902. 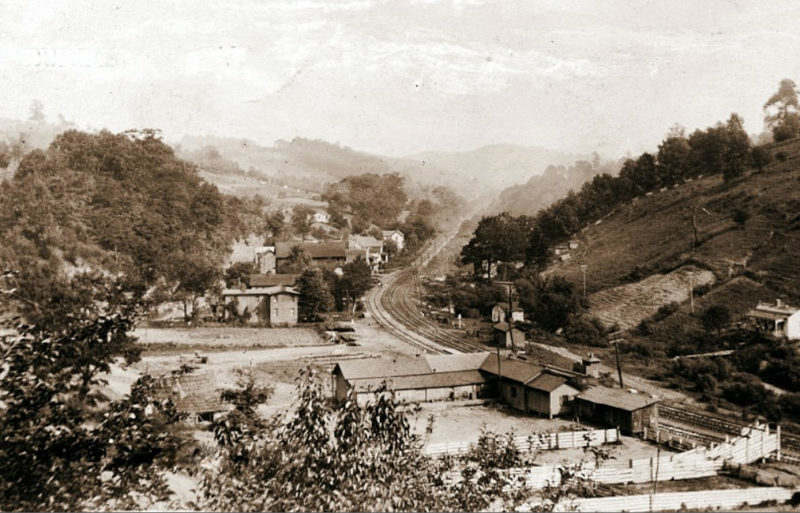 The Short Line greatly aided the development of the ridge-country between the Ohio and Monongahela valleys where coal, oil, and natural gas were abundant, and many small towns, such as Pine Grove, developed along the route. Though information about the line isn’t widely available these days, Ethel Morgan shared her memories of the Short Line in the 1970s and wrote of a remarkable incident in which a young friend saved a train from a potentially fatal disaster. Her memoir speaks of a time when life seemed more simple and the train’s daily runs were a source of excitement. In the early 1900s the Short Line Railroad was running trains over the new road bed, and at that time it was not very secure. Large landslides often covered the tracks, and big rocks rolled down the steep inclines and often rested on the train tracks, especially during spring thaws and hard rain storms. Leslie Staley recalls that he went to work in 1915 on that section of railroad when he was 15 years old. He made 15 cents an hour and worked along with three other laborers. The boss was Sheridan Edgell, and they worked from 7 a.m. until 6 p.m. on six miles of track. Section crews consisted of four men and the boss. They rode to work from the tool house at Porter’s Falls Station on a hand car, propelled by men pumping up and down on a lever connected with the wheels. I was a crude affair compared to what is used today, as were the engines, which were fed with lump coal carried on the engine to make steam after stopping at the water tank that was situated along the tracks. The tank at Porter’s Falls was filled with water from the creek by men who came regularly to see that it was filled. The six miles of track was their responsibility, but if big wrecks occurred at other places, they were sometimes called to help and worked overtime if needed. It was during this time that a slide with a large rock covered the track just across the creek from the Martin home near Porter’s Falls. The Martin family’s young daughter, Minnie, was out on the back porch watching for the passenger train to come along. All the children along the way looked for the train and waved to the engineer. Engineers Carr and Bull were two who always toot-toot-tooted and waved. Seeing the slide, and knowing the passenger train was due, Minnie knew that someone should flag the train. She ran to the barn and bridled Old Dobbin, and down into the creek she went astride the horse. He had to swim, but she knew he could make it. The train was whistling, but she got there just in time and flagged it down with her skirt. Minnie was much talked about afterward. Her bravery and quick action saved a train and perhaps many lives. She was given, it was said, free transportation on the train by the supers as long as she lived. Later, she married an engineer, Santford Brookover, and many important railroad officers from Wheeling and other towns at a distance attended the wedding. I was there, too, as one of the bridesmaids. The wedding was a gala affair in our community. A special white dress was made for the occasion for me by my aunt. Aunt Eva was another bridesmaid. She now lives in Cambridge, 0hio. And so was Ethel Eakin, of New Martinsville, and Marie Bonner and Kate Klipstein. My mother was matron of honor. Percy Yoho’s mother, Minnie Yoho, was a sister of Minnie’s mother. Minnie being two of the same name in the family, Big Minnie and Little Minnie. Little Minnie was an only-child and brave, boisterous, and quickwitted. Her grandparents were very proud of her. Envious folk around would refer to them as “Big It and Little It.” Sam Morgan’s Post Office, kept by him, was named Minnie, too, in their honor. As I mentioned before, train wrecks and cars off the track were common happenings since the road bed was new and very crooked. I’ve heard it said that the engineer could shake hands with the conductor in the caboose on some of the abrupt turns and curves. All mishaps had to be reported.